Haka Educational Tours endorsed by Space Camp as a Recommended Operator. 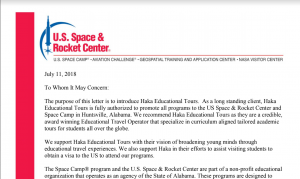 Haka Educational Tours is delighted to be endorsed as a recommended tour operator to Space Camp at the U.S. Space and Rocket Centre in Huntsville, Alabama. Haka Educational Tours operate out of New Zealand and run tailored, curriculum aligned academic tours for students from all over the globe. Our purpose is to broaden young minds through real life travel experiences and Space Camp’s fully immersive learning environment and focus on personal growth and development, closely aligns with this purpose. From astronaut training to simulated space shuttle missions, Space Camp inspires students in the realms of Science, Technology, Engineering and Maths, otherwise known as STEM. We pride ourselves on our precision planning and can create bespoke itineraries based on your specific learning outcomes, to ensure your school group enjoys a totally stress-free tour. If you’re a school group from Australia or New Zealand interested in offering the Space Camp experience to your students, you can have confidence when choosing Haka Educational Tours as your educational travel provider.